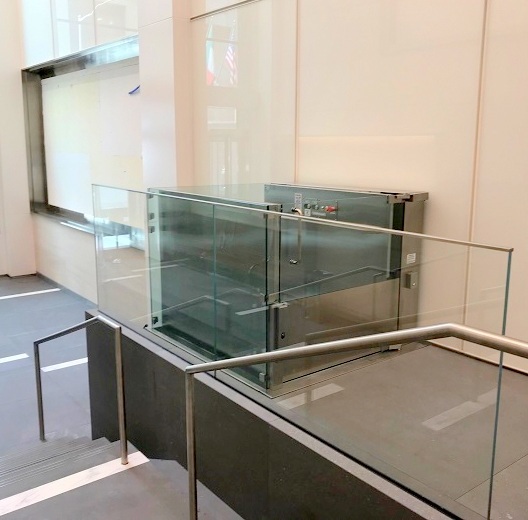 Home → Wheelchair Lifts → 645 5th Ave.
On 645 5th Ave. in New York City, located in the lobby of the Oxford-Olympic Tower, Mobility Elevator has installed a glass and stainless steel wheelchair lift, known as The Prestige. This new addition adheres to the structure for the purpose of Americans with Disabilities Act (ADA) compliance. The Oxford-Olympic Tower is a 51 floor skyscraper, built in 1976, featuring shops, offices, and owner-occupied luxury condominium apartments all in the same building; the first of its kind. It was developed by Aristotle Onassis and designed by the world-renowned architectural firm of Skidmore, Owings & Merrill. Specifically, it contains 225 condos and 250,000 square feet (23,000 m2) of office and retail space. Due to the publicly accessible nature of this complex, it was important to consider wheelchair accessibility. Our first responsibility is to our customers and all the others who use our products and services. 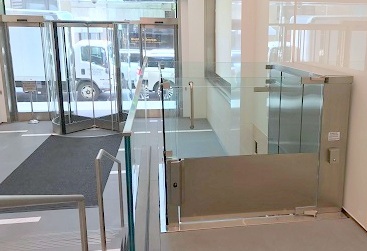 Working alongside Turner Interiors of NYC as a general contractor, Mobility Elevator installed a sophisticated custom designed wheelchair lift. 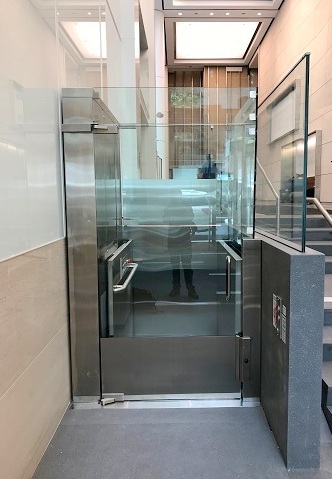 The Prestige features half-inch structural tempered glass with no visible frame making this lift the ultimate statement in barrier free access in commercial settings. A full sized glass door is included for the lower landing and has a half-sized glass gate at the top. This lift can be configured for up to 6 feet of travel and can stop at 2 levels. Being made from stainless steel and glass, The Prestige blends seamlessly and easily into various structures. Mobility Elevator was thrilled to take on this project because we are considered a premier accessibility and lift company for both residential and commercial markets. Since the Olympic Tower features both residential and commercial spaces, we were a perfect fit for this project. Are you looking to install a wheelchair lift with custom, barrier-free access? Choose The Prestige for your accessibility needs. Contact us to learn more.